Overall, if you’re looking for an entry level, low priced wax for your black car or truck, I don’t think you can go wrong with this kit. When it comes to color restoring… The results that I had on my Miata were a decent at restoring that deep “jet black” look. I’d rate it a 7/10. The colored pigment wax pretty much ruins towels and hands and anything that it touches, and I kinda think it’s marketing hype. Coming in at number #2 in our top black car waxes is the Turtle Wax Black Box kit. Here at ScannerAnswers, Mike, Matt and I have been on a quest to find, test, and review the top waxes for dark and black paint. This weekend I got to test out Turtle Wax’s famed “jet black box wax kit” and here’s my thoughts. I have tried dye-based waxes in the past. The experience can only be described as messy or filthy. You will get black dye all over your hands, shirt, pants, face, and even your elbows. After waxing my car, I looked like a coal miner having a bad day at the office. This is the reason why I had my apprehensions in this Turtle Wax Black Box Kit review. I usually shy away from colorant-based waxes or polishes simply because I don’t want to throw away a brand new microfiber cloth after just one use. This is the fact you need to face when using a colored wax like the Turtle Wax Black Box Kit. Luckily for me, the kit comes with a pair of black applicator pads. The box also contains two bottles of 12 oz. black spray detailer, one 12 oz. bottle of black pre-wax cleaner, and a single 12 oz. bottle of black carnauba wax. What really baffled me was the requirement to use the black spray detailer to wipe off the residue left behind by the pre-wax cleaner and the black carnauba wax. After allowing the pre-wax cleaner to dry, you will need to spray a light mist of the black spray detailer before wiping off the dried haze. The same rules apply to the black carnauba wax. In this review of the Turtle Wax Black Box Kit, you will find out if the complete 3-step detailing process is worth the extra time and effort in restoring the beauty of your car’s black paint. The Black Box Kit is an all-in-one solution designed exclusively for black or dark-colored cars. The exclusive tint technology utilizes unique pigments to effectively hide the scratches and swirl marks on the black paint. With those words alone, it is easy to discern that the Turtle Wax Black Box Kit will not physically remove light scratches and swirls. The pigments in the black tint will only serve to cover up the blemishes on the surface of the paint. As the product wears off, the scratches will be visible again to the naked eye. This kit is a good quick way to cover up swirls and scratches in your black or dark paint without having to use a DA sander, claybar, and polish. The black carnauba wax included in the kit is formulated with black dyed pure carnauba wax to bring out the true beauty of black paint. I actually like carnauba and I still believe it is the best natural wax to treat all types of paint colors, but black carnauba wax? Is Turtle Wax serious? Apparently, the company is dead serious about this product. In order to get a grip on the issue at hand, I purchased the kit and proceeded to follow the three-step process recommended by Turtle Wax. I washed and shampooed my car before wiping it dry. It is a good idea to wear a pair of gloves before working with the Turtle Wax since your hands will resemble the grubby paws of Chewbacca after handling the product. I decided to treat the entire hood of my black 1997 Mazda Miata. Step one was the black pre-wax cleaner. I poured a small amount on the applicator pad and worked the product using small overlapping circles. I allowed the cleaner to dry to a haze. After spraying a light mist of the black spray detailer on the dried haze, I removed the excess using a clean microfiber towel. At this point, the hood was looking good. I poured a small amount of the black carnauba wax on a separate applicator pad and worked the product on the entire hood. What I really like about the Turtle Wax Black Box Kit is the ease of application. All the products are easy to apply and easy to remove, but I still wish it wasn’t as messy as I imagined. After allowing the black carnauba wax to dry, I again grabbed the bottle of black spray detailer and lightly misted the hood before removing the excess with a clean towel. My results were a mixed bag of emotions. Sure, the color and the shine was definitely better after following the tedious 3-step process, but I already wasted a pair of new microfiber towels just on the hood alone. I’m not joking when I say the products are filthy to use since each step will leave your cleaning towels permanently soiled and stained. With the Turtle Wax Black Box, you will need to treat one body panel at a time to produce great results. I sprayed a bit of water on the hood to test the water beading protection of the product, and honestly, the results were quite admirable. However, I can still see deep scratches and swirls when viewed at an angle, although the minor swirls were covered perfectly by the Turtle Wax Black Box Kit. If you are looking for a wax or polish that is capable of buffing out swirl marks and blemishes permanently, this is not the product for you. I highly recommend the Turtle Wax Black Box Kit for slightly older black cars and SUVs. I don’t see any reason why you should use this on a brand new finish since the black tint infused in the product might alter the OEM black paint of your ride. I’m still having a hard time getting my head wrapped around the idea of spraying black detailer before wiping out the haze left by the pre-wax cleaner and black carnauba wax. I previously thought the spray detailer was exclusively for spot cleaning or detailing after applying the wax. Now I know why this kit came with two bottles of the spray detailer since you will end up using a lot of it each time you decide to wax your car! 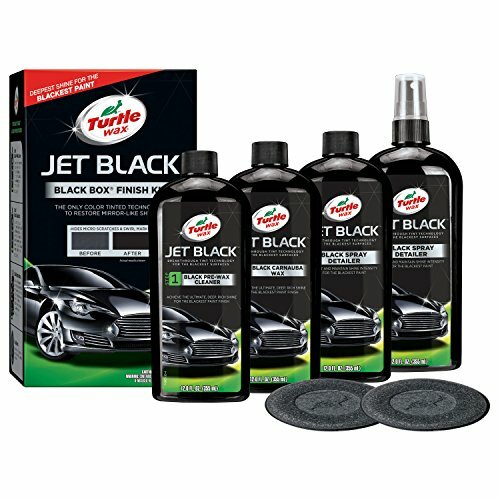 If you have an older black or dark-colored car and you want a wax and polish that is easy to apply and remove, then it wouldn’t hurt to give the Turtle Wax Black Box Kit a try. It’s the perfect beginner-friendly kit for someone that doesn’t yet have, or want to spend the money on a proper set of claybars, buffer, polish, and wax. As for removing scratches and swirls, I’d give it a 6 outta 10. While it’s better than just slapping on some carn wax, it’s not going to buff out scratches and marks like a claybar and polish and buffer will.